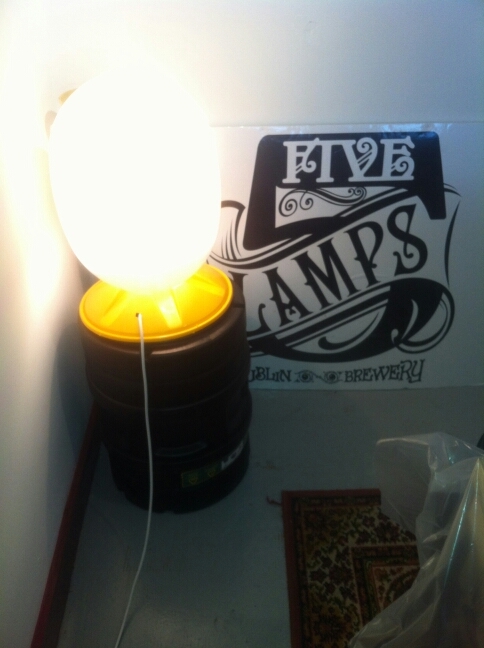 A friend of mine works for the 5 Lamps Dublin Brewery, and we often meet up over a coffee to chat about the trade and see how things are going for the both of us. One of these days I expressed an interest in joining him on his delivery route, so we decided to go for it the next day. I’d shadow him, give a hand with the kegs, and write about what it’s like. So, here’s my account of that day. I arrive at the brewery where John is making a list and checking it twice of which pubs have ordered what kegs. We load up the van with bloody heavy 50 litre lager kegs and the more forgiving and lighter plastic kegs full of their seasonal ‘summer steam’ beer. In the office part of the brewery I see an unusual lamp. John tells me that their brewer William made it from one of the plastic kegs. It has a thick protective case and a bag inside that contains the beer. A cool little invention. 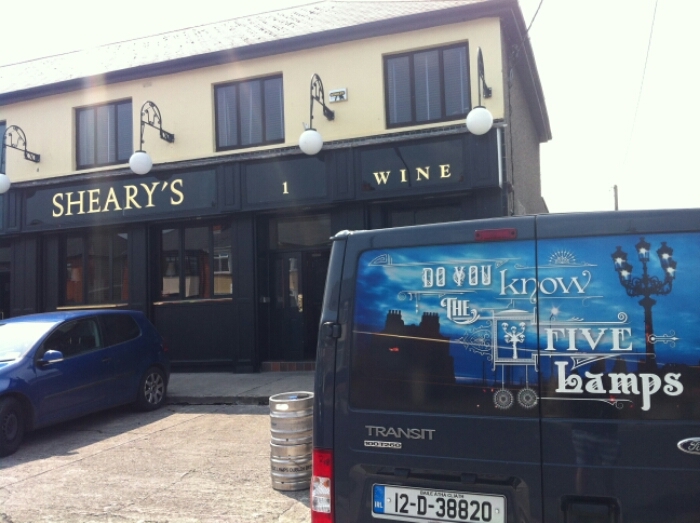 We head off on our first stop to Alfie Byrnes. We drive into the underground car park and delivery area under the Conrad Hilton. We’re in and out in a flash. That was quick, this will be easy! Nope. There’s quite a lot of heavy and awkward lifting in these deliveries. There isn’t always someone waiting there to meet you and do most of the heavy lifting, and not every place has a mechanised lift to bring the kegs downstairs. Sometimes you have to make do with gravity, and a sandbag to cushion the fall. 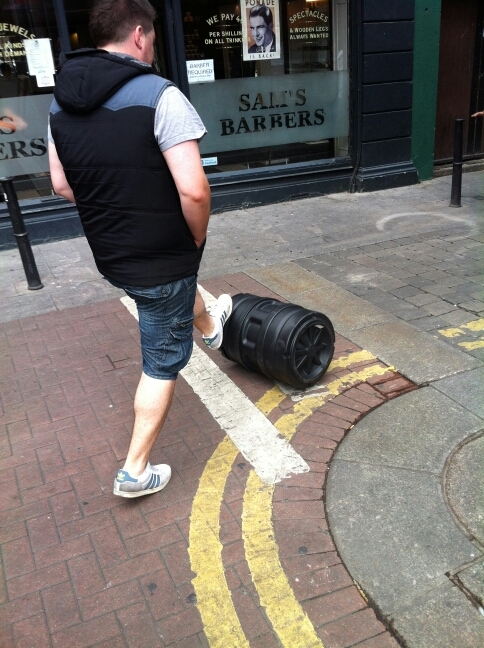 I noted to John that I’d seen a video of people unloading kegs in Dublin go viral, so I took a video of him dropping one or two down into the cellar. Any excuse for some social media material. 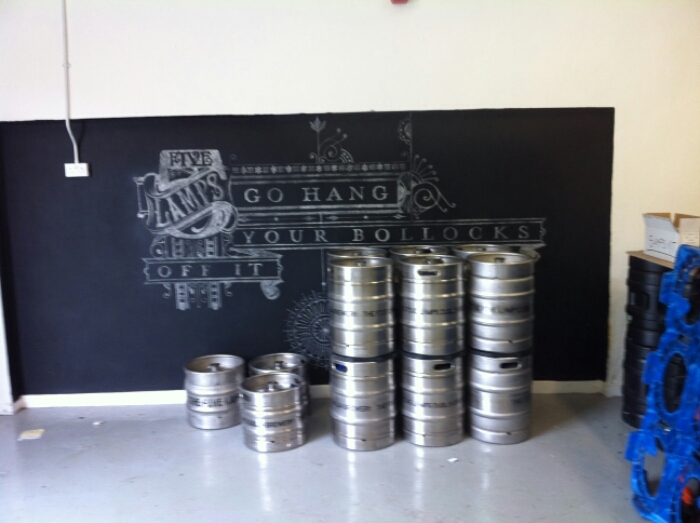 This is the delivery into the Norseman in Temple bar, a craft beer pioneer in the tourism driven area. We crisscross the city centre, making around 6 stops. The Bull and Castle seems to be one of the bigger customers. They take a steady stream of lager and a few of the summer steam beers for their rotation tap. Visitors to christchurch pass by and seem very interested by our delivery. I suppose it’s interesting because it’s not something you often see. It’s the ‘behind the curtain in Oz’ equivalent of the pub trade. This is John using a very technical transportation method. (Dont worry, it doesn’t hurt the beer. We asked a master brewer). 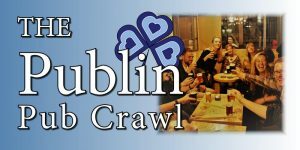 We take a spin out of the city towards Crumlin and a pub that I’d intended on visiting for quite a while. 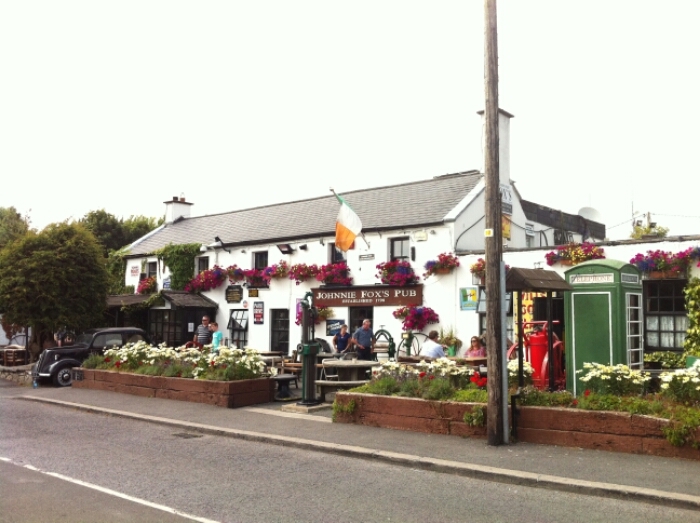 Shearys pub is run by Mick Sheary, a great supporter of Publin and a publican who seems to take great pride in his pub. 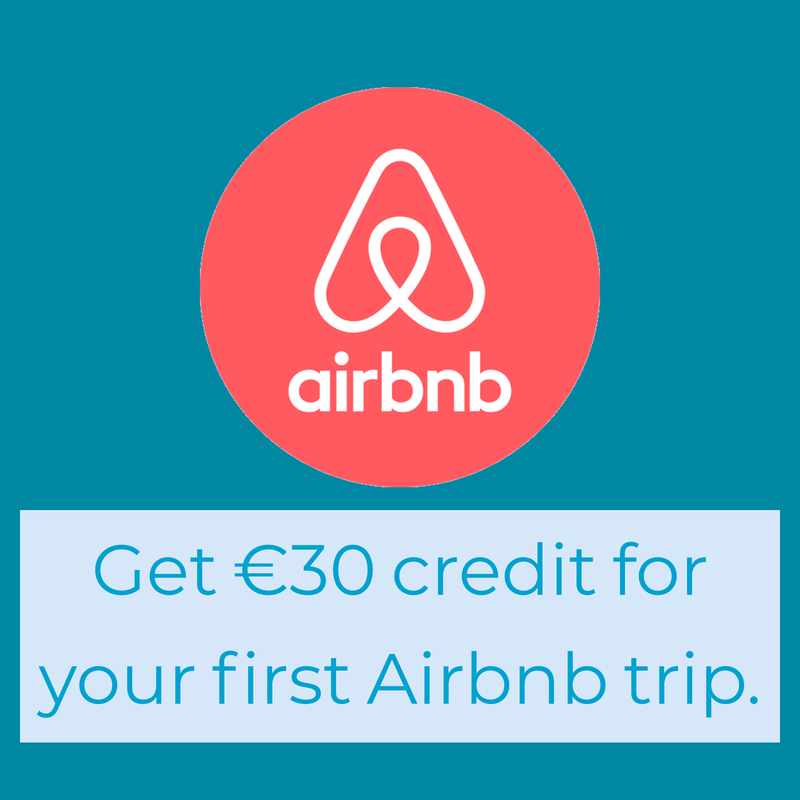 As soon as you walk in you see references to their stellar craft beer offering and a cutout naming Shearys as one of the top 10 craft beer bars in Dublin. Mick’s surprised to see me in tow with 5 Lamps John and immediately gets us outside for a photoshoot with the van and a few kegs. Mick has clearly very much embraced social media. He’s also very proud of his pub and what they’re doing with craft beer. He’s adamant that people shouldn’t be penalised for wanting to drink good beer. He sets his prices for each of the craft beers at €4.90, which is less than or equal to the cost of Heineken etc. There’s still a place in his pub for Guinness, Fosters, and others, but the craft beer has brought in new customers to Shearys and is clearly working. 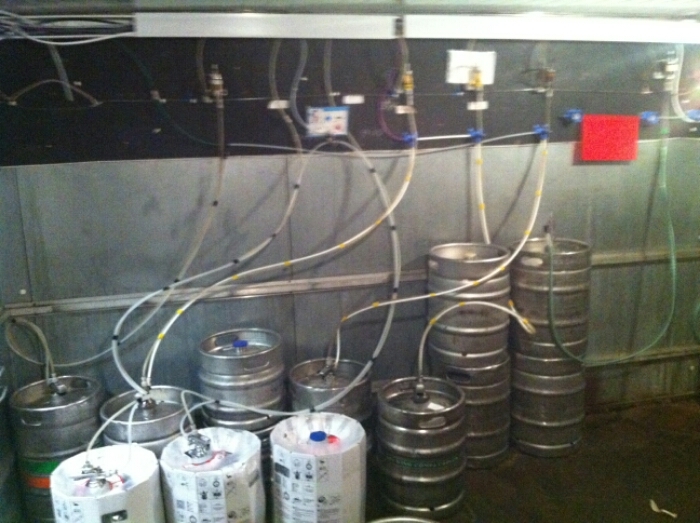 Mick brings us to the back of house where we get to see the cold room where all the taps are hooked up to the kegs. All the way around the room there’s pipes coming out of the wall, sucking up the beer and delivering it to the front bar. It’s spotless. Mick tells us how he gets everything serviced twice a year. We’re on our way out and Mick is still trying to get me to have the full Shearys experience- “Have you ever pulled a pint of Guinness before? In you come!” Tilt at 45 degrees (I think), don’t let the tap touch the glass, bring it up just over the harp and then leave it to settle. One of the regulars is shouting something about getting the pint for free because I pulled it. We leave him to deal with the aftermath. The bar is immaculate, the atmosphere is friendly, and I would be a very happy man if this were my local. Shearys is a great example of how craft beer can expand to and survive in the suburbs. After lots of short pit stops we welcome the scenic drive out to Johnnie Foxes pub in Glencullen. It’s a whistle stop but I manage to get a few photos in. John advises me to go and take a peek into their dining and entertainment room. It’s unreal, and the photos don’t do it justice. There’s seating for around 100 people and a decent sized stage. Hanging from the roof are pots and pans, clothes, and other items of interest seemingly gathered over decades. The room is breathing character. 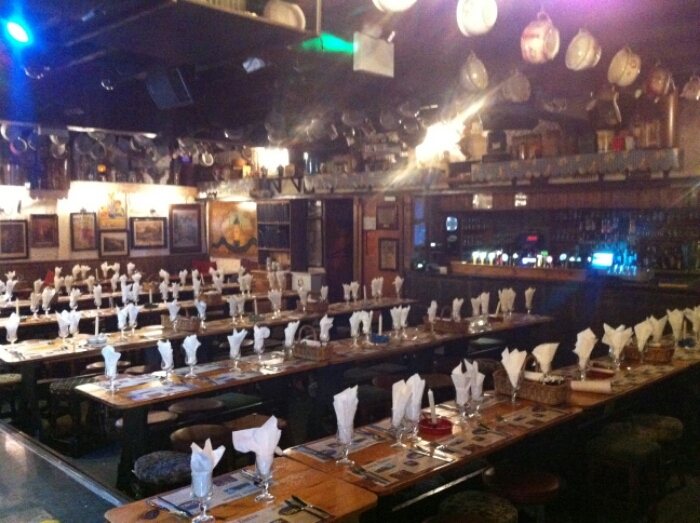 I wouldn’t have thought that Irish music or dancing in the company of bus loads of tourists would be my thing, but I would like to experience this room when its packed with cheering visitors. The guy taking the delivery has cut his hand, so he quite literally signs the docket in his own blood. We’re off on the road again and back to the brewery. 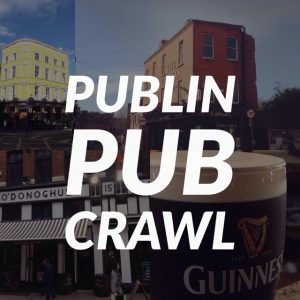 We take on a few more kegs of lager and make our way around to camden street and to Devitts and Planet Murphys. It’ around 4pm and I’m a bit tired and hungry. I tell John I think I’ve experienced enough for one day and off I go back home. And so ended ‘bring your Publin to work day’. There were no huge surprises along the way, just a lot of heavy lifting, the odd chat, and our discussions about the trade and how well 5 Lamps seemed to be doing. 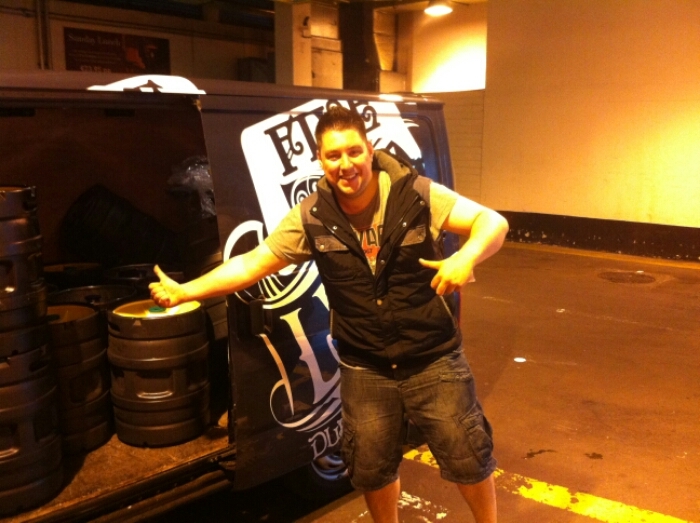 Will I some day be doing a ride along on a lorry stacked with kegs?